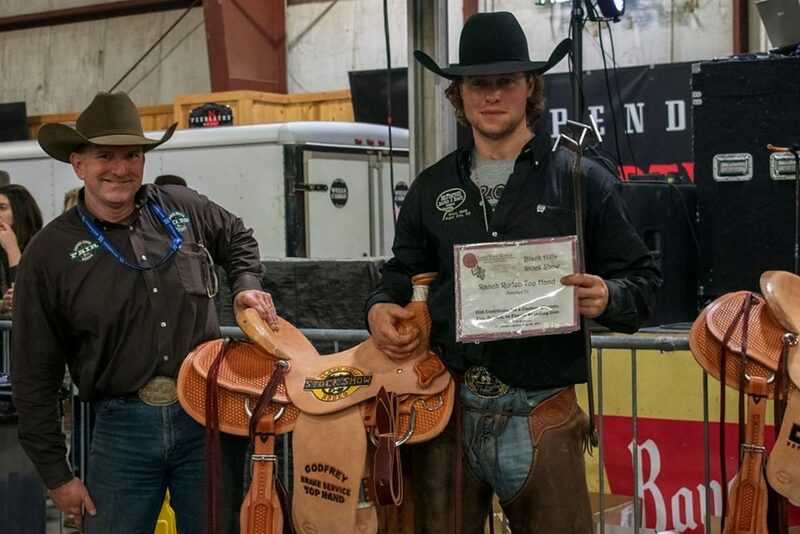 To listen to Clint Nelson speak about his performance at the Black Hills Stock Show Ranch Rodeo, you'd be certain he fumbled around through the whole ranch rodeo, but to watch it was another thing altogether. As a member of the winning team, Nelson was where he needed to be when he needed to, getting the job done as efficiently as possible– something that stood out to the judges. "The top hand, in my opinion, can do whatever needs to be done to make whatever event they're in happen and let them win. You can tell the guys that know what they're doing and when they need to do it," said one of two judges who will remain anonymous. He judges the event on a semi-regular basis. 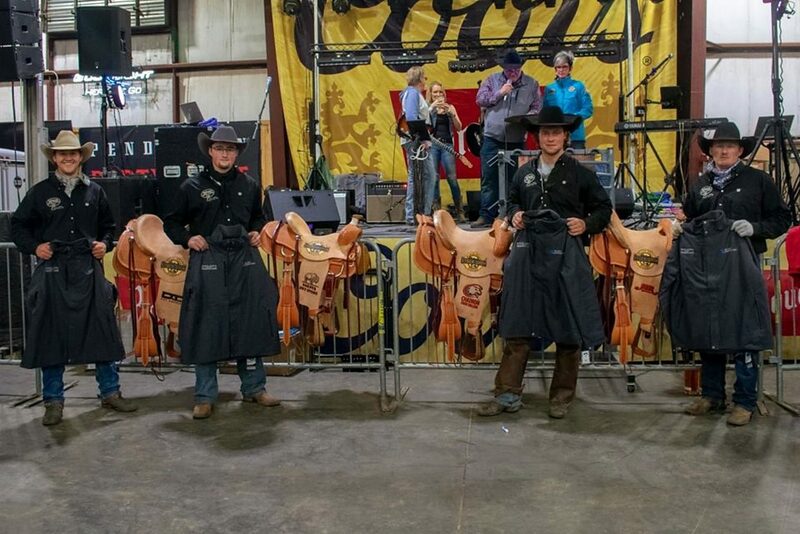 The McPherson Auction #2 team ended second in the preliminary round of the ranch rodeo Jan. 29, which paid $1,500 and qualified Nelson and crew to move on to the finals round that evening. "I've competed at the ranch rodeo for four or five years, but this is the first time I've been on this team before," Nelson said. "I've won the 2017 Central States Fair rodeo with Brent and Tanner McInerney, but this is the first year Marty McPherson was on the team." The team, sponsored by McPherson's uncle, came out of the game winning the first event of the finals, Blake's trailer loading, with a :56.58. Nelson said he was somewhat surprised they took the win in the event, which required members to unload four horses to rope two teams and load them into the trailer, all while another team attempts the same. "We had to load two steers, one in the front, one in the back. Tanner can get on his horse in the trailer, and by the time I was on my horse, he had one roped, hazed it in, and had the gate shut, then here comes Brent with the next steer," Nelson said. "I was kind of the one they put in danger's way— I'm a brute— so the steer starting going in the trailer, and the rope was around my waist. I told Brent just to go, keep kicking. There was just enough rope to slide around me, and he went in." 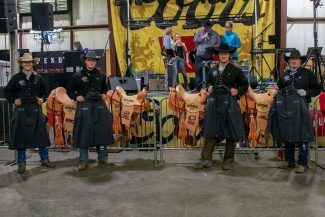 In rope, mug, and tie, in which team members sort out two numbered steers, roped and mug them down, and tie three legs, McPherson #2 placed second with a 35.27 second performance. Nelson rode a borrowed horse throughout the event since his horse sustained an injury, and the two weren't completely used to one another. "I roped my steer, and bay horse wanted to go left, and I wanted to go right," Nelson said. "I lost my rope and the steer I had roped had tied himself to the other steer. I had to wait for those two steers to come untangled, and the other guys had the other steer doctored and loaded." Nelson said head, heel, and brand was "nothing special" and the team did pull fifth place, but Nelson's quick thinking is part of the reason he stood out as a top hand contender. 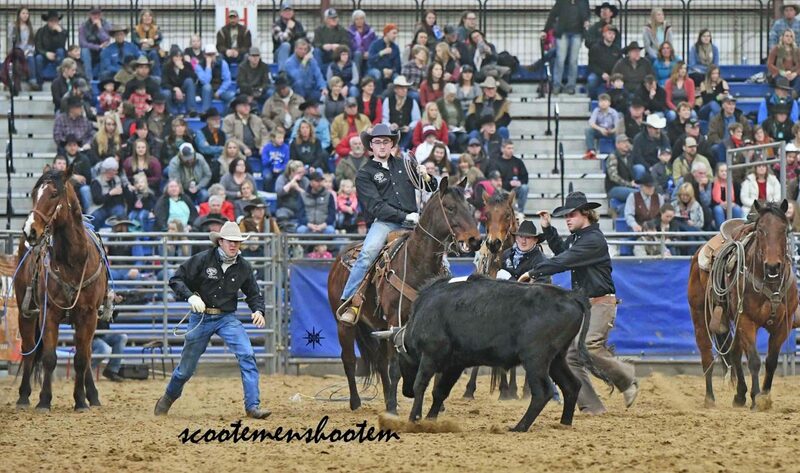 "Marty and Tanner were having a little trouble getting the steer laid down, and all the ropes had to be off," he said. "I ended up getting ropes off their steer, took a wrap on my horn, and took the head rope off of ours while he ran the branding iron back." At 6'5" and 220 lbs., an uncommon but not unheard of size for bronc riders, Nelson put up a fight to stay on his Burch horse in the bronc riding. "I got a pretty nice little horse. 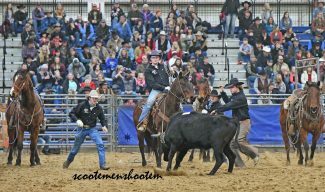 It kind of come down the wire with two teams, and I damn near got bucked off, but I got sat back down and made it through. It wasn't pretty," he said. His sixth-place bronc ride was part of what edged out their win over Promiseland's 10th place bronc ride. Promiseland ended second in the ranch rodeo. "In the end, to win it, you just about have to ride the bronc," the anonymous judge said. "There's been some people that have been in the lead in the past, but got bucked off in the bronc riding. In Clint's case, he made a damn good bronc ride. He just did. There were a lot of other guys who do that, too, but you can tell the ones who stand out." The 26-year-old gets practical ranch rodeo practice on the family's ranch near Philip, South Dakota, where they run 500 to 600 calves through the winter in addition to their mother cows with Nelson's dad and uncle. He also puts on jackpots through the summer and leases steers out. "We don't have enough ground for me to grow a cow herd a bunch more, so I keep steers on a smaller lot," he said. "I enjoy it. I like going and helping in some ropings; it's fun to watch the kids show up and compete." Nelson competes on the bull-dogging circuit, even making an appearance at The American preliminaries this year. His usual stage is generally amateur rodeos throughout South Dakota.